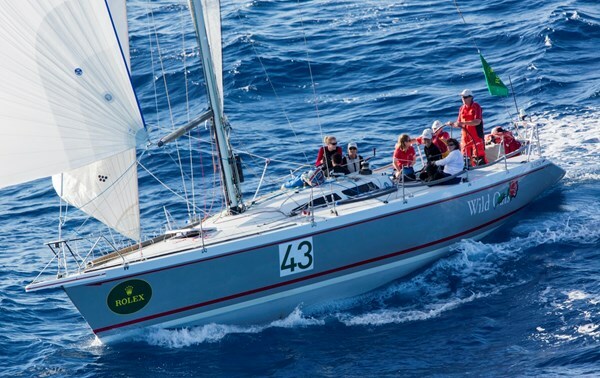 Wild Rose, skippered and navigated by legendary DBSC members, Roger to Hobart ("R2H") and JJen, respectively, missed a few Laser races but did win the 70th edition of the Rolex Sydney to Hobart race. R2H: ".....actually, I prefer the tiller to a wheel, as it reminds me of my Laser." Waiting at Constitution Dock in Hobart was a huge crowd. I want to ask R2H and JJen whether they will spend the northern hemisphere summer with us in the Med teaching us to sail properly. I'm over spending time whitening my teeth and eliminating the tan lines, and we need to work on increasing boat speed. I can't believe what rubbish my new boat is: I've dropped $40 million on a boat with a rear end the size of Kim Kardashian's, and we got beaten over the line by 10 year old Aussie Maxi and whipped on corrected time by a tiny 29 year old Australian boat. They tell me the little bugger broached, whatever that is, in the midst of a 30 plus knot blow in Bass Straight, whereever that is, at night, and broke its steering cable. The crew dropped sails, fitted a tiller, whatever that is, fixed the cable, put the sails back up and presto.... They were up and running in 12 minutes, and then went on to win the race. It just goes to show what positive influence R2H's calm and quiet voice has in a crisis. Darn it. I'm going to sell my boat on eBay when I get back. Kristy: hang out with JJen and get a Red Jacket for next year's Hobart. I'm so proud of representing the electorate where DBSC is located. Seeing JJen and R2H around DBSC on Saturdays is just so motivating for the kiddies. We are thinking of selling the Couta, and getting a Radial Laser each. I've done 38 S2Hs now, and you can never be over prepared. This year, racing my Laser in 38 knot westerlies, steering by tiller, sailing by the lee, broaching, while getting very wet was perfect practice for this edition of S2H. R2H: "I can't wait till I try it out on the first day of the DBSC Autumn Pointscore on 10 January 2015. And Lord knows some of my fellow clubmen could do with a watch to time the start"
New Year's Day - today - 4pm splash!